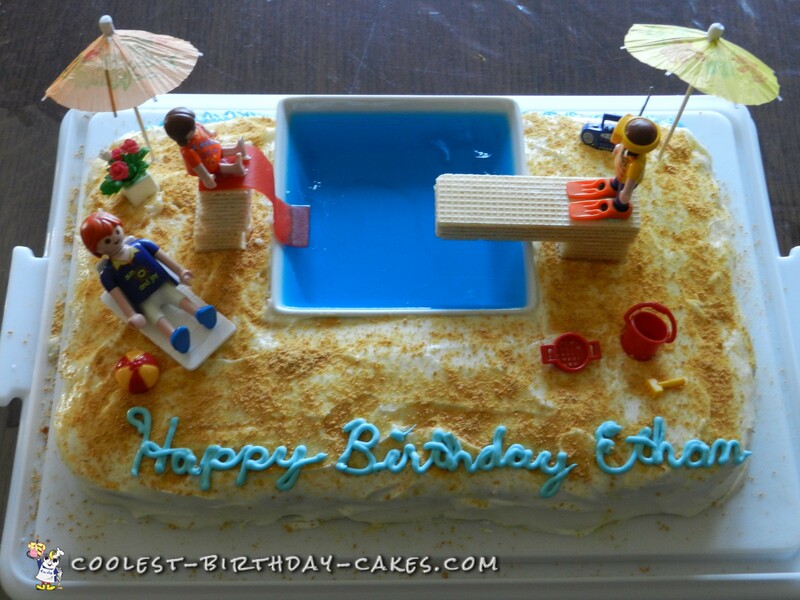 For my son’s birthday, I wanted to create a cake that had a pool theme. I’m not very talented at making Jello (as my kids don’t enjoy the texture) So that part was just for looks! It was relatively easy enough to make. I baked a 9×13 cake and frosted it with vanilla icing. I sprinkled graham crumbs on it, to get the sand look. The base of the slide and the diving board were made of vanilla wafers. A rollup candy was the slide. I used Playmobil figures and toys for the rest. The Jello was put in a square Pampered Chef shallow dish. This served as the pool. The kids had the most fun taking the Playmobil people and diving them into the pool! Birthday cake idea Posted by Jennifer K.